Buckle up for an all-new DANIEL TIGER'S NEIGHBORHOOD one-hour special when “Tiger Family Trip” premieres Monday, May 8, on PBS KIDS. As many families prepare to travel during the spring and summer, Daniel and his family embark on a first and memorable road trip, helping preschoolers learn key skills and strategies as they experience their first trips. In “Tiger Family Trip,” Daniel is excited about his road trip adventure to visit Grandpere, but he doesn’t know what to expect during the long car ride. With Mom Tiger’s assistance, Daniel experiences new sights and activities and learns about the many exciting things to do and see when you’re on a trip with your family. Produced by The Fred Rogers Company, the Emmy-nominated DANIEL TIGER’S NEIGHBORHOOD teaches preschoolers practical strategies and skills necessary for growing and learning. A recent study showed that kids who watched DANIEL TIGER’S NEIGHBORHOOD had higher levels of empathy, were better at recognizing emotions, and were more confident in social situations. This was especially true for low-income children and kids ages four and younger. The popular animated series was created by some of today’s preeminent innovators of quality children’s media. Creator Angela Santomero, from lead production partner Out of the Blue Enterprises, is co-executive producer, along with Kevin Morrison of The Fred Rogers Company and Vince Commisso of the award-winning animation studio, 9 Story Media Group. “Tiger Family Trip” will repeat throughout the week of May 8 on PBS KIDS and the PBS KIDS 24/7 channel and live stream. 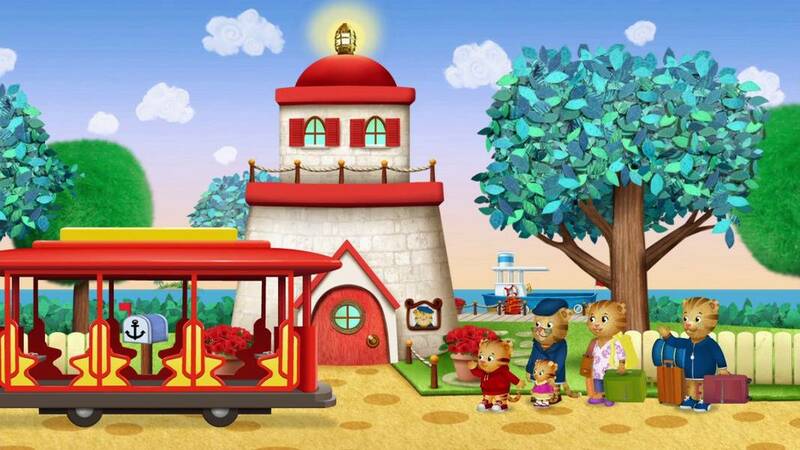 The special will also be available for free on pbskids.org and the PBS KIDS Video App. Additional new episodes from DANIEL TIGER’S NEIGHBORHOOD will debut throughout the week of May 8 (check local listings), and will also be part of PBS KIDS Family Night on May 12, 13, and 14 on the PBS KIDS 24/7 channel and live stream. New content will be available in the Daniel Tiger for Parents app, which features more than two dozen songs, supporting videos from DANIEL TIGER’S NEIGHBORHOOD, and helpful hints for parents about the important skills children need to be ready for school and life. The Daniel Tiger for Parents app, available in English and Spanish, is free to download on the App Store and Google Play. In addition, engaging new DANIEL TIGER’S NEIGHBORHOOD books, music, and DVDs are also rolling out. Books, including "Tiger Family Trip" and "Going to See Grandpere," are now available on Amazon. The "Daniel Tiger's Neighborhood Travel Album," which features 13 new songs, is now available on iTunes, Amazon, Google Play, and Spotify. A new DVD from PBS Distribution called "Tiger Family Trip" will debut on Tuesday, May 16.In addition to joining the Tiger Family on their trip to Grandpere's house, viewers can watch Daniel attend a carnival, enjoy fireworks, and set up a lemonade stand with Prince Wednesday. In an all-new one-hour special, the Tiger Family heads out on a road trip to Grandpere’s! At first, Daniel doesn’t know what to expect on the ride, but with a helpful map from Mom Tiger, Daniel learns that there are so many exciting things to do and see when you’re on a trip with your family. “The Lemonade Stand” - Daniel and Prince Wednesday are making a lemonade stand together. But when they don’t agree about how to hand out the lemonade, they need to learn to express their mad feelings so they can find a solution…and provide lemonade for their neighbors! “Mad at the Beach” - Daniel is at the beach with Miss Elaina and they’re building a sandcastle. Suddenly, the creation they worked so hard to make is knocked down by a wave, and that makes them mad, mad, MAD! Dad teaches the kids that it helps to express your mad feelings. “Daniel Feels Two Feelings” - Up, up and away! Daniel, Katerina, and O are excited to fly a kite, but are frustrated when they can't keep the kite in the air. They find out that it’s ok to feel two feelings at the same time. “The Neighborhood Carnival” - The Neighborhood Carnival is in town, and Daniel can’t stop thinking about riding the Ferris wheel for the very first time. But when he gets to the carnival, he feels both excited and scared. Will Daniel ride the Ferris wheel or wait until next year?